Correct your astigmatism with Dailies AquaComfort Plus Toric contact lenses by Alcon & Ciba Vision. These highly impressive toric lenses are some of the most popular daily disposable contact lenses for astigmatism, providing an unrivalled degree of comfort, convenience and clear vision. Part of the renowned Dailies range of contact lenses, these toric lenses utilise Lightstream Technology to offer a unique shape that fits eyes with astigmatism and ensures clear and stable vision. You’ll experience zero interruptions to your vision with these daily disposable contact lenses, with nothing getting in the way of you and your sight. 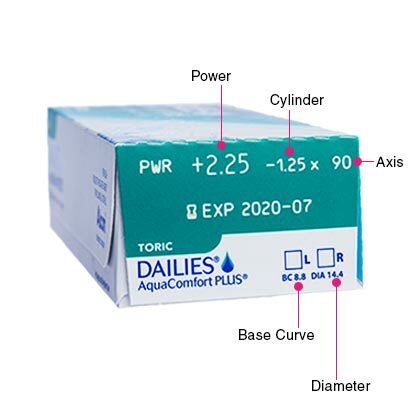 Dailies AquaComfort Plus Toric also deliver an exceptional degree of comfort for you and your eyes, making use of blink-activated technology so as to provide moisture each and every time you blink. This translates to eyes that stay hydrated all day long, making these daily contact lenses your perfect choice for a busy day at the office. 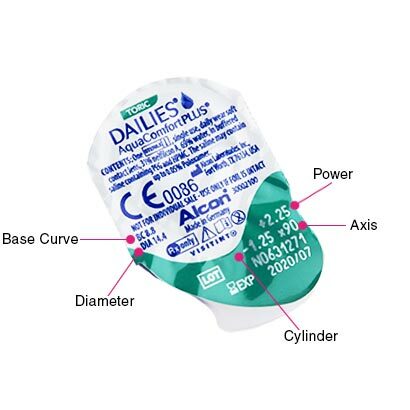 Enjoy freedom from glasses and total convenience with these daily disposable contact lenses. You can experience a full day of clear vision and excellent comfort with each pair of these lenses, before simply discarding of them before bedtime. 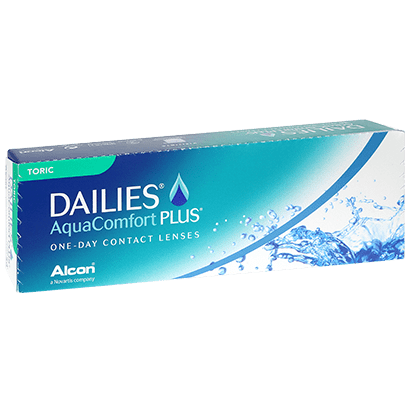 By applying a new set of Dailies AquaComfort Plus Toric contact lenses the very next morning, you can be sure that hygiene is maintained each and every day. 1 Day Acuvue Moist for Astigmatism are similar daily toric lenses. Good comfortable contact lenses. Have been using these for a number of years and had no problems at all. Great-had them for years...fast delivery service-all great! Never had a bad lens very comfortable. Stuck with product recommended by optician. Suffer with dry eyes - get a full day wear from these 7am - 11pm with no discomfort. Highly recommend. Only complaint is the non-toric lenses have been known to rip easy but this has only happened 3 times in the last year. Great quality, never get dry, feel super comfortable. Very good lenses that give me the same great quality of vision that I get with my glasses which can be difficult as I have astigmatism in both of my eyes. They do not dry my eyes out and give high levels of comfort all day. The vision I get is just as good as my glasses, best contacts I have ever used. 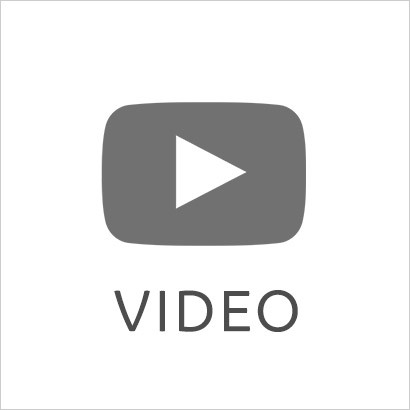 Excellent product very easy to use and comfortable to wear. Great comfortable lenses at a good price. Excellent product. Very comfortable to wear and always gives clear vision. Great product. My eyes don’t get sore and I wear them from morning until night. My vision is clear all day. So easy to use pop them when I get up and put them in the bin at night which is convenient for my work schedule. Really easy to order from this site, look forward to receiving them. Spec savers was cheaper but you have to pay over £100 upfront so very happy I’ve found this site. Optician prescribed after trying three different types over years so they''re good quality and for, and it was just cheaper, quicker and easier to buy them online. They are comfortable to wear and were like the one I was getting from store near my home but they were little bit high in price so that''s why I''ve switched to this one. I love these contracts, no bother with them, my eyes always feel great. These were not comfortable for me I was only managing around 6 hours wear time. I changed to another brand through reading other people’s reviews and found a lens which suit me better now managing 12/14 hours wear so comfy I forget there in. These are the worse contacts I have ever put in my eyes, they are so uncomfortable. A waste of £40. Good contacts, I use them every day and this is coming from someone with sensitive eyes!! These contacts are the best for me however I do think they are a bit pricey. My proscription is at the extreme end of what is available commercially. Unfortunately, I could not get my exact proscription in this brand however my optician assured me than I would not notice a few points difference. I have worn these lenses 5 or 6 times, the longest period being for about 9 hours. I have not had any discomfort or problems so far. I have used this particular product for many years until I was told some months ago by my optician that they were no longer able to offer me the product. I was given three different types of toric lenses to test and they were all unsuitable. Dailies Aqua comfort Plus Toric are the best ever lenses I used so I sourced my next supply form Feel Good Contacts. Will never use another brand! Super quick delivery. Not the cheapest and you should look at reducing prices, however, I like the fact that I can order my lenses at the last minute and get them delivered the next day. You could also look at offering free delivery on all orders, regardless of how much you spend, if you’re not going to reduce prices. excellent contact lenses. Very very comfortable, you dont even know you are wearing them. Have no problems wearing these daily lenses. Works for me and fits my eye properly. It doesn’t get too dry either towards the end of the day! Always find these comfortable and good vision. I have astigmatism so need the toric lens. Next day delivery. The more you buy the better the price. Great product but always end up with more R lens than L lens in the boxes. feel better than competitors lenses in therms of hydration and comfort. Have tried other toric lenses but these are the ones that work for me. Got me out of a hole when I was on the point of running out . Exactly the same as my opticians prescription. Good service, contact lenses feel good. Very good quality product and extremely comfortable to wear. Easy to put in and comfortable to wear! Comfortable and easy to put in and take out. I purchased these for my husband , service excellent, product excellent , price also one of the cheapest I have found . I would defiantly recommend your company . Fantastic efficient service. Keep up the good work. Very comfortable and eyes do not dry out. Great fot too! Will buy again! Really efficient service...fast and reliable. Absolutely would recommend to others. Thank you! Great lenses - extremely comfortable and easy to put in and take out. My 13 year old daughter wears these every day and they seem to suit her well. Great lenses , very comfortable . Work well for me. Very comfortable. I only wear contacts for sport and holiday so not got much to compare with. Tend to get a little dry, but better than Toric Dailies I used to use. Very good product . Never had any issues with theseveral. I have not worn lenses for that long. These are very comfortable. Definitely would recommend!! Comfortable toric lenses. Reasonably priced. Comfortable contact lenses, easy to put in. Excellent product for those with an astigmatism. Brilliant lenses, far better than standard Ines. Much clearer and sharper and last 12-16 hour days!! Over the moon!! I do a lot of running and fitness and these have never let me down. Very comfortable during exercise and resistant to sweat. The best Toric contacts I''ve tried, I can wear these for around 14 hours before they start to feel dry. Can''t feel them in your eyes whilst wearing and easy to put in. No issues with these only contacts I have tried but no reason to change. ~Best option I have found for Astigmatism for me. Least drying and settle better in the eye than most others. Easy to use but eyes get a bit ''sticky'' towards the end of the day if lenses inserted in the morning. Perfect fit and prescription. Couldn''t be happier. Cheaper than opticians and quick delivery. Simple reordering process. You forget you''re wearing them. They''re that good. Comfortable, easy to use and so convenient. 5 stars!! Great and fast service! Highly recommend. Good products. Slightly expensive though. Very happy with these lenses. Able to wear them a lot longer than my previous ones without my eyes feeling dry. I have used these for years they are fantastic. Bought these for going on holiday after using monthly lenses. Couldn't believe how comfortable they were even after a couple of very long days (15hrs) . With monthly lenses my eyes were starting to get uncomfortable after 6-7 hours. Highly recommend. Great contact lenses - comfortable and not dry even after a good 11hrs! Comfortable all-day wear. The increase in diameter allows the lenses to remain attached to the eyeball curvature better than the old product. Good lenses, a little pricy but worth it. good, however pretty much the same as your standard dailies Id say,I dont personally notice that they are any more comfortable than the standards? I''ve only tried two brands of contact lens and for me, this brand was the best in terms of ease of putting the contact lens in my eye and taking them out.